Presenter (Shaun Ley): The World This Weekend! This is Shaun Ley. Hello! Universal Credit begins tomorrow, but only if you’re single, a new claimant, and live in Ashton-Under-Lyne. We will be examining the Government’s cautious start to what could be a dramatic re-shaping of the welfare state. Newreader (Neil Sleat): The Government is being warned that it is facing huge logistic problems in bringing in Universal Credit. The idea is to replace Employment Support Allowance, Housing Benefit, Working Tax Credit and Child Tax Credit with a single payment. Speaking on the eve of the start of a pilot scheme in Greater Manchester, a leading independent IT consultant, Brian Wernham, told this programme there were considerable risks for the Department of Work and Pensions. IT Project Expert (Brian Wernham): By 2017 over 12m people will have to have their details enrolled in the system – so that’s a rate of 300,000 per month getting into the system – 15,000 people a day. So from October onwards the speed will have to ramp up very quickly. Shaun Ley: Well with me is Brian Wernham, a leading IT independent consultant – author of the book “Agile Project Management for Government”. Brian, welcome to the Programme. 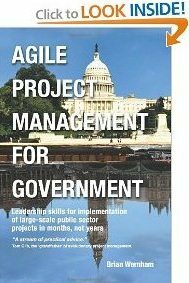 It could be argued that the Government has been quite Agile, in that it has moved from four pilots to one in the first stage, for example. Do you think that it has recognised the potential scale of the challenge that it faces with this? Brian Wernham: It certainly has. The biggest risk for any IT project in Government is going for a ‘Big Bang’ implementation – like we saw with Terminal 5 when British Airways decided to send all of its aircraft for unloaded at Terminal 5 on the very first day of implementation – of course this meant that the staff not only had to grapple with new procedures and new facilities, but also they just hadn’t got the time to solve any bugs and problems. And so BA’s case they had over 10,000 people left without their luggage and it took them weeks to sort out the problem. Shaun Ley: It’s a bit frustrating if you’re stuck without your luggage at the airport, but potentially much worse if you are stuck without the money you need to pay your basic bills. In terms of making this system work, how challenging is it to combine information from different computer systems, for example the income tax system, the social security system, and also presumably the systems that local councils use for paying out things like Council Tax Benefit and all the other the other benefits that are channelled through them? Brian Wernham: There are so many different interfaces and so many different databases that have to be consistent. The address database, for example, to make sure that you don’t have multiple fraudulent applications from the same postcode. The Department for Work and Pensions pays out more than £500m per day in Pensions and Benefits – so £250m a day will be paid out every day through this new Universal Credit system when it goes fully live in 2017. That’s the same as a Trident nuclear submarine being launched every few days. So obviously they have to be very careful with their testing. When they find any bugs in the system it’s going to take weeks to solve the bugs, so the rollout will have to be careful. Shaun Ley: So in terms of this rollout, they’re starting tomorrow with this one part of the country – a limited range of claimants. I mean people who are new to the system, don’t have any dependents – are single themselves. What’s the scale of the transition they’ve got to get through from there to 2017 ? Brian Wernham: The pathfinder that’s going to open tomorrow is in only four postcodes around the Ladysmith Centre just east of Manchester. And it only covers people who are single, new applicants, and who are only eligible for Job Seeker’s Allowance. One expert estimates that it is less than 1% of the total number of claimants just in that one particular area. And Tameside Council say that it will be only 300 applicants a month – that’s only a dozen or two dozen people a day from Monday – so it’s very very gradual. Shaun Ley: So how does that compare with what they will have to achieve by 2017 ? Brian Wernham: Well – they are going to have to rollout to about 300,000 people a month being taken onto the system – 6.5m households, each covering several people would have to be taken on by 2017. So they will have to rollout to more types of benefit, and the complication here is that you have to take into account not just one person’s circumstance, but everyone else who is in the household. All of their income – and their benefits interrelate. To work out how much they should be paid in Universal Credit you need all that information – and you need a very clever computer system to calculate it. Shaun Ley: And clever programmers behind the computer system! Brian Wernham: Well there are many of those – over 1,000 people were working on this programme at its height – and a Freedom of Information Request showed that over £1/2m a day was being spent on programming and development. Shaun Ley: Brian Wernham… It’s going to be fascinating to see how it all develops. Thanks very much for joining us this lunchtime. Brian Wernham: Thank you very much.